Come spring, most of us light up - our grill, that is. Clean that grill before firing it up. Before you light that match or turn on the gas in the spring, stop and think. That grill has been sitting out in the yard for six or seven months accumulating dirt, insects, and rust. Just as you wouldn't fry an egg in a dirty frying pan, you wouldn't throw a juicy steak on a dirty grate. Would you? I didn't think so. Here's the best way to clean a grill and get it ready to glow for another season. Never use and oven cleaner on your grill. It can damage the finish, plus it's a bad idea to put a caustic substance on the grates where food's going to go. Now to keep that grill clean, treat it just like you would any other cooking surface. If you're like most people, you've got a trusty, much-used gas grill sitting on your patio or deck. And if you're like most people, gas grill cleaning isn't something you've done you since you bought it. Clean your gas grill before firing it up for a new season. If your gas grill needs more power to cut through a season's worth of grease and gunk, give Weiman Gas Range Cleaner & Degreaser a try. How to clean a grill grate? Remove the grill grates (or grids) and briquettes, and set them aside. Wash the burner grates and drip pans with soapy water and a plastic scouring pad, and then set them aside. Cover the gas openings at the control panel with plastic bags and/or aluminum foil to keep them dry. Then clean the inside and outside of the grill with a brass bristle brush and warm, soapy water. Rinse it with a garden hose, and then wipe it dry. Remove the plastic/foil covering on the gas openings. 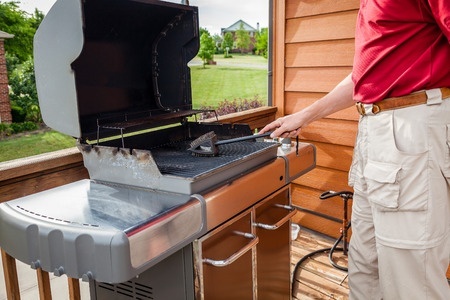 To keep your gas grill in top shape, after each use close the lid and turn the heat on high for 15 minutes. Scrape the grates with a wire grill brush. If the grates are cast iron, season them with oil. Plan to thoroughly clean your grill every six months, or at least at the beginning and end of the grilling season. Cool and wash with warm soapy water. Turn off the gas at the tank and remove the propane unit. Clean the tank with warm, soapy water and wipe it dry. Clean the gas connections with a paper clip. Clean the outside of the grill and check for chips. Sand and touch up chips with a paint designed to withstand high temperatures. If you store your grill outside, replace the propane unit and cover the grill. If you store your grill inside, keep the tank off of it. Store the tank outside (away from kids and dryer vents) in an upright position. Cover gas line openings with plastic bags to prevent bugs and spiders from nesting there.